Some days ago, after seeing the important note about the graphics size change for blocks, I decided to remake the graphics for my Timer Effect suggestion, as 24*24 effects. I decided to use the same effect template, to show my vision of how current effects could look in the new size. I tried to add a cross to those neutral effects, but I couldn't make them look well due to space restriction issues with the template. I believed that leaving the space empty could work for representing neutrality, thus decided to make the effects like that. Added low gravity and protection. I have no idea how to make the curse skull. Fully saturated effects look fine to me. I guess that the true issue here is not the saturation, but lack of shadow like the current effects. I'll work on shadows once I finish re-drawing all effects in 24*24 size. This is not a suggestion, this is a vision. It'll stay here. It looks good, but it's too small, and more importantly, it has an odd width. But I guess I can make one based off it. Thank you. It’s obviously a graphic suggestion. Or you don’t suggest graphics right now? Updated the initial post with 24*24 graphics for the missing effects. The pack is now complete, and can be put forward for consideration. I think the X's to represent effect removal were so much easier to understand. 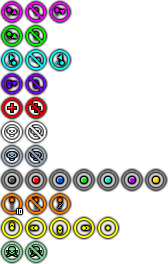 Improved effect removal graphics, using the No Entry line technique, formerly used in Zoey's effect revamp suggestion. 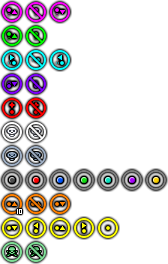 EDIT: Also improved protection, multi-jump and gravity effects.